Poster Art: I have won the grand prize in the 2008 Oktoberfest poster design competition on behalf of the city of Munich. My pop art design was shown on posters, in brochures, and on memorabilia ranging from beer bugs to glasses, t-shirts and caps. The Oktoberfest poster in all its glory. nd the winner is....I have won the grand prize in the 2008 offical Oktoberfest poster design competition. The competition has been organized by the city of Munich to celebrate the largest beer festival worldwide, the famous Oktoberfest which has been a landmark event for 175 years now. A closed competition, the jury has chosen from 21 entries, seeking designs which highlight the uniqueness of the festival by communicating a joie de vivre, as well as humor and overall charm. My motif is essentially a vibrantly colorful pop art collage using some of the "usual suspects," a heart, a Ferris wheel, a pretzel, and – this goes without saying – a beer mug. I used an ink brush for the design, and CG colorized it on-screen. My award-winning design will be used to promote the Oktoberfest on 7,000 posters and in 90,000 brochures in both German and English languages. In addition, the design will be displayed on the official "Oktoberfest Beer Mugs" which have been collector's items since 1978. It will also be featured on assets like mugs, glasses, steins, t-shirts, caps, etc. All participants receive a participation fee of 500 euros. The award winners receive 2,500 euros (first prize), 1,250 euros (second prize), and 500 euros (third prize), respectively. An additional license fee of 5,000 euros is paid to the winner for the merchandising rights. Further, the winner will be assigned to design the offical Oktoberfest brochure. This year around, the jury has decided on only two winners, and has left the third prize unawarded. The trophy money for the third prize is therefore shared among the winners. 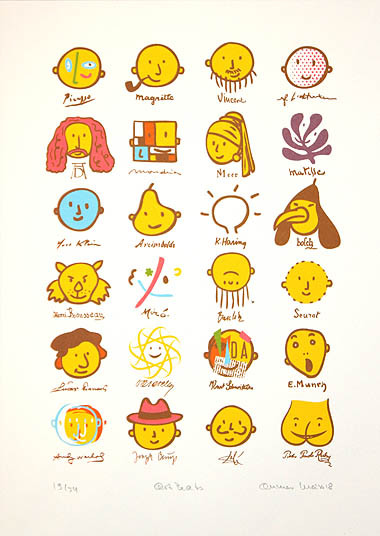 The Oktoberfest poster design competition has been a closed competition since 2000. The invited participants were allowed to enter two designs each. The jury had no knowledge of who created which design since the competition required anonymized entires. 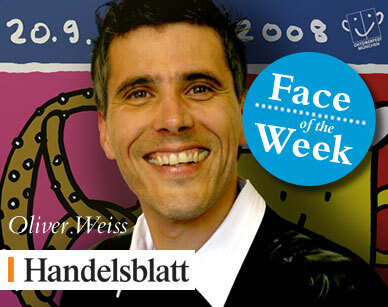 All invited artists and design agencies come from Munich and Germany. The largest folk festival in the world, the Oktoberfest is legendary. With a history spanning almost 200 years, this unique event has done its share in helping the city of Munich evolve into a leading European tourist spot. This is certainly in part owed to the fact that the "Wiesn", as the Oktoberfest is also known, has always managed to be both a folk festival for the people of Munich, as well as a big international event. This is my design for the official Oktoberfest three-fold brochure informing on the event and specifying the site by means of a hand-drawn map. 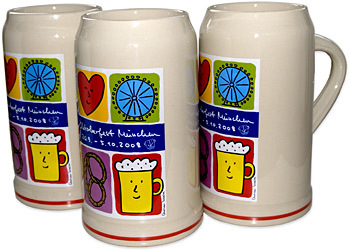 Produced by Rastal, a major manufacturer of kitchenware, the monumental one liter stoneware stein has been a collectors' item since 1978, with prices for out of print steins selling at up to several hundred dollars. Each mug is dated on the front and carries a copy of my signature on the bottom. 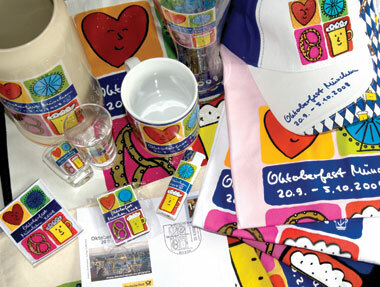 Selected kitchenware, apparel, and the commemorative stamp featuring Oliver's Oktoberfest design. 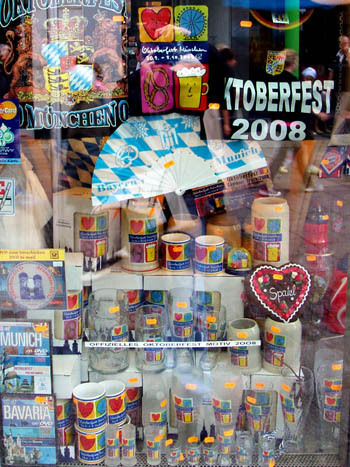 A souvenir store display at Marienplatz right in the center of Munich showcasing abundant Oktoberfest merchandise products featuring my artwork, ranging from beer steins of all sizes to glasses and t-shirts.